Microsoft will cut approximately 18,000 jobs within the next eleven months, CEO Satya Nadella wrote in an announcement to staff. This round of layoffs will be the largest in the company's history and the largest since former CEO Steve Ballmer cut 5,800 employees in 2009. Roughly 12,500 employees brought on as a result of the Nokia acquisition, which occurred in April, will be let go. The deal added 25,000 employees to Microsoft's payroll. At the time of the acquisition, Microsoft said it would cut $600 million (about £350.8 million, AU$640 million) per year in costs. How will this affect Xbox and Nokia products? Although most of the cuts will be made within the Nokia division, approximately 5,500 jobs will also be cut across other lines of business, including marketing jobs in the Xbox unit, as well as marketing jobs in other divisions, according to Bloomberg sources. The layoffs are unlikely to impact how consumers experience Xbox and Xbox products. Nadella has insisted Xbox will be a top priority for Microsoft under his tenure. Additionally, Microsoft devices head and former Nokia CEO Stephen Elop said "there will be limited change" for the Xbox and Surface divisions. The company-wide changes will dramatically affect Nokia products. In his July 17 memo announcing the cutbacks, Nadella said he is focused on integrating Nokia into the Microsoft business. As a result, select future Nokia X devices will be migrated from Android to the Windows Phone operating system. This tactic allows Microsoft to continue to compete in the budget smartphone market and ensures that budget smartphones users are running on Microsoft's platform of choice. Nadella is also expected to make changes to the engineering organization, which will likely consolidate the roles of software testers and developers, as cloud building has made it easier for developers to test and fix issues autonomously. Microsoft has more than 127,000 employees globally. The majority of employees who will be let go are expected to hear from Microsoft within the next six months, Nadella said in his memo. As a result of the layoffs, Microsoft will have to pay $1.1 billion (about £640 million, AU$1.17 billion) to $1.6 billion (about £940 million, AU$1.71 billion) in severance and related benefits costs and related charges over the next four quarters. Rumors of the impending layoffs began circulating earlier this week, shortly after Nadella outlined Microsoft's trajectory in an email to staff. 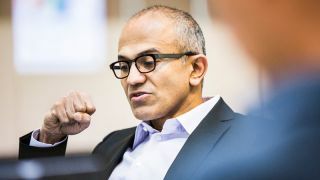 In the email, Nadella said he is focused on driving Internet of Things, mobility and cloud innovation. What does TechRadar think of the Nokia X?